Bahasa Indonesia, English, Dutch, Javanese, and other local dialects. Muslim, Protestant, Roman Catholic, Hindu, Buddhist. In 2008, the population of Indonesia was estimated at 237,512,352. Bali, Ubud, Jakarta, North Sulawesi and Kalimantan. The climate is hot and humid year-round in coastal areas. The dry season is from June to October, and the rainy season from November to March. There are total of 17,508 islands in Indonesia. Out of these five are large islands; the rest are small in size. Java, including Madura (132,035 sq.km). •The 5 biggest cities in Indonesia are Jakarta, Surabaya, Bandung, Medan, and Semarang. •Indonesia is the world’s 16th-largest country in terms of land area. 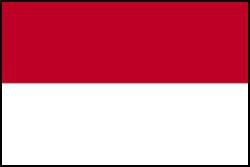 •Indonesia’s national motto, Bhinneka tunggal ika, is derived from Old Javanese (kawi), and means ‘unity in diversity’. •Homo erectus, or Java Man, lived in Indonesia between 500,000 and 2 million years ago.